“It is with some trepidation that I set pen to paper to record -what? What can one write about a personality whose holiness and spiritual wisdom stretched over many decades, who was shepherd to thousands of souls, saving them from destruction and bringing them into ‘a place of verdure’? About the comforter, the advisor, the father, the refuge of every soul in pain and every confused thought? About the last person who walked and strove in the ascetic life with the holy fathers whom God was pleased to give our generation, those who died to live, because, in living they were dead to the world. ‘so that the world may live’ through Christ, to Whom he brought it through his way of life, his teaching and his prayers? What can one say about a man who rivalled Saint Païsios in his humility, Saint Porfyrios in his discernment, Father Sophrony in his wisdom and Elder Iakovos in his love? In September of 1969, I’d just taken up a position at the University of Thessaloniki. I visited the Pournaras bookshop, which was at that time not merely a place for selling books but somewhere where colleagues could meet. It was a reference point, you might say. Browsing through the new books spread out on the counter, I heard someone ask Panayiotis Pournaras. ‘I’ve heard that there’s a new professor at the university. A Mister Galitis. Do you know him?’ I turned and saw a pleasant-looking figure, a priest with a red beard, a tranquil look about him, kindly eyes and a bright smile, just at the moment when Panayiotis was pointing to me, ready to make introductions. We chatted for a while and I was impressed by his interest in the new books and also by how well he was up in theological matters. He was following the current theological situation, which was hardly common among priests dedicated to their pastoral work. I saw Fr. Symeon shortly afterwards at the headquarters of the Metropolis. He’d been appointed a member of the Supervisory Committee of the Seminary, where he’d been Director. The Chairman of the Supervisory Committee, a highly placed cleric, with all the exuberance he could command behaved towards Fr. Symeon with excessive familiarity, with his teasing and slightly ironic and disdainful manner, which made me, at least, feel awkward. But Fr. Symeon was undisturbed and behaved like an ‘altar-boy’. He made an obeisance and remained silent. My discomfort then became admiration for the wonder of humility. Fr. Symeon’s office in Saint Theodora’s was in the right wing, on the first floor. He asked me to visit him there, which I often did, most gladly. He came to my office, too, but not so often because he couldn’t leave the School much. I recall with nostalgia our long discussions on spiritual, theological and ecclesiastical matters. He was a profound anatomist of the soul and, at the same time, an erudite theologian with rare learning, which he was always trying to increase. He discussed well, had a clear mind, breadth of spirit and a particular sharpness. He would grasp a subject quickly and was comfortable even talking about secular education. Later, he began vigils at Saint Theodora’s. At one of these he had the joy of tonsuring one of his spiritual children. Fr. Symeon was the person who introduced this new form of vigil, which did not last all night, but covered two or three hours before midnight, and about an hour after, with a half-hour homily. In this way, people who were working and couldn’t get to a liturgy in the morning and for whom an all-night vigil would have been too much had the chance to participate in liturgical life. This practice found many admirers and is now popular in many parts of Greece and abroad. Every liturgy Fr. Symeon served was a real and literal initiation into the sacrament. It was solemn, neither drawn out nor hurried, without highlights, but not monotonous. At first, he didn’t have chanters. Anybody who could would do their bit. Even I chanted on occasion. These first impromptu chanters usually sang poorly and this created the impression that Fr. Symeon actually wanted this: low profile, no special effects. This would encourage contrition. A friend of mine told me off once when I departed from this ‘rule’. But soon proper chanters began to appear and the cultivation of music became part of the whole training the people acquired by being close to the blessed Elder. and the traps the devil sets. At church, man is healed. These are not just words. It’s the truth. is for the healing of our illnesses. If you take it this way, you are already healed. and doesn’t go is precious. Whatever needs to go, God will take away. be it an illness or demonic influence. but also for deliverance from body illnesses, as well. Let us pray to God for everything time and again. Not because God needs us to pray to him again and again. because, precisely, God wants to see our faith. learns something by reapeating it. If He heals you, you are healed once. will your soul be healed, too. from the leprosis of sin. and whatever else hurts us. as if all his problems are solved. This entry was posted in Contemporary Elders, Elder Sophrony, Elder Symeon Kragiopoulos, Living Signposts and tagged A Man of God, Contemporary Elders, Elder Iakovos, Elder Sophrony, Father Sophrony, Fr. Symeon Kragiopoulos Liturgies, Fr. 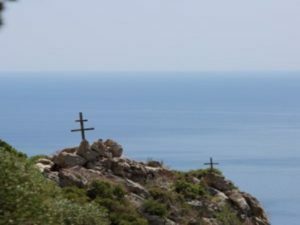 Symeon Kragiopoulos vigils, humility and discernment, π. Συμεών Κραγιόπουλος, π. Σωφρονιος Εσσεξ, Νοερά προσευχή, Προσευχή Ιησού, ομιλίες π. Συμεών Κραγιοπουλου, Orthodox Saints as the 'Liturgical' Beings, Saint Paisios, Saint Porfyrios, The Orthodox Theologian, The Portrait of a Spiritual Father, Vigil in the Orthodox Church.